Cut all vegetables in chunks. In a large pot, heat 1 tbsp of oil and slightly brown the vegetables (they bring a lot more aroma into the stock that way). Pour 2.5 l of water and reduce heat to a medium. Add the bouquet garni and leave to bubble away for about 1 hour. Take off the heat and leave to cool, with the vegetables in the stock (get all you can!). This yields about 2l of stock - I then keep the carrot chunks and mash them. First, brown the meat: In a large pot, heat 1 tbsp olive oil and brown the beef cubes from all sides. Remove from the pot and keep aside (once slightly cooler, I cut up the cubes even finer). Back in the pot, add 1 more tsp of olive oil and brown the onion and garlic. Add the tomato sauce, reduce heat to medium. Add the stock, the corn kernels, the tortillas and the cheese. In total, cook the soup for about 45 minutes. Somewhere at midtime, add the meat so that it heats up again. You could blitz the soup without the meat and corn, but I really like the consistency it had as such - the crunchy corn, the tortillas binding the soup, everything had its place in this recipe. And, a confession: I was so tired that I could not even chew the tiny bits of meat, so I just had the rest of the soup. And a revelation: the soup is SO DELICIOUS, with just enough spice to awake my spirits, that I really did not need the meat and may turn this recipe into a vegetarian one! 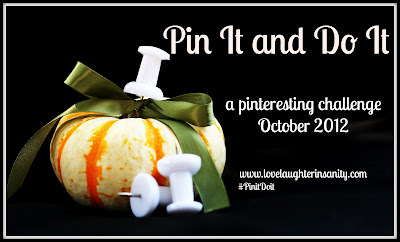 This is also my third pin in the Pin it and Do it: A Pinteresting challenge, hosted by Trish. Glad the soup perked up your spirits - it looks delicious! thanks JoAnn - it did help! Mmm... I like spicy soups or flavor that has a little bit of a kick. Thanks for sharing your recipe, and feel better soon! Sorry you haven't been well but the soup sounds just great. Hope you feel yourself really soon. Get well soon! A spicy soup sounds like the perfect medicine. Hope you feeling better soon! The soup does sound perfect. Sometimes a little warm spice is just what's needed. You know, in all my years of cooking and all the homemade soups I have made, I have never made my own stock - crazy, huh? I will have to try that. Yum, a spicy soup should be just what it takes to knock that cold out. Hope you feel better soon! Already on the mend! Thank you so much!